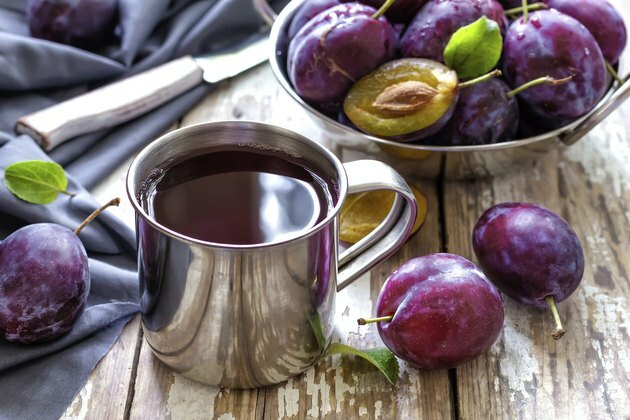 What Are the Benefits of Drinking Prune Juice? Prune juice, made from a type of plum fruit, has many benefits to your health including improving digestion. Drinking the dark purple juice may also help to prevent chronic diseases because of antioxidants it contains. The sweet and slightly tart juice also provides a good source of certain essential vitamins and minerals needed to maintain your overall health. Many people drink prune juice as way to regulate digestion. If you're constipated or commonly use laxatives, you may benefit from drinking prune juice. Dietary fiber and natural sorbitol found in prunes help to prevent and treat constipation. According to a study published in June 2008 in the "Korean Journal of Community Nutrition," constipated people who ate prunes and drank prune juice daily had an increase in the number of bowel movements per week, a decrease in time needed per bowel movement, softer stool consistency and less discomfort while having a movement. Drinking prune juice helps meet your daily requirement for fruit servings. Plant-based foods are an essential part of a healthy diet because they contain vitamins, minerals and antioxidants. According to an article published in the journal "BioFactors" in 2004, prunes are an excellent source of phenols, a type of antioxidant. These compounds help protect your cells from damage caused by harmful free radicals. A diet rich in antioxidants may help to prevent certain chronic diseases, such as cancer and heart disease. Drinking prune juice helps you meet your daily needs for certain vitamins. It's a good source of vitamins C and K and the B vitamins riboflavin, niacin and B-6. Vitamin C functions as an antioxidant, helps form strong connective tissue and supports your immune function. Your blood's ability to clot relies on adequate vitamin K levels. B vitamins in prune juice help with energy metabolism, maintain healthy red blood cells and help regulate brain, nervous system and immune function. You'll also get certain key minerals from drinking prune juice. Iron, which is found in prune juice, is an essential part of the hemoglobin molecule in red blood cells. It's needed to transport oxygen from your lungs to your cells and helps to prevent anemia.Prune juice is a good source of potassium as well, which helps balance fluids in the body and maintains proper heartbeat, muscle contractions and nerve impulses. Manganese, a trace mineral in prune juice, is needed in tiny amounts by the body and helps with metabolism and bone formation. Is Plum Juice Safe to Drink While Pregnant?